Termination of mid-trimester pregnancy remains a significant clinical problem. In order to avoid operative procedures such as hysterotomy, a number of techniques for the induction of uterine activity resulting in spontaneous expulsion of products of conception are being investigated. 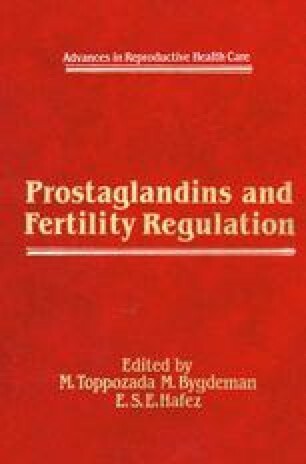 Since the 1970s the naturally occurring Prostaglandins E2 and F2α have been used to terminate pregnancy (Karim and Filshie, 1970; Bygdeman and Wiqvist, 1971; Embrey, 1971). Naturally occurring Prostaglandins E2 and F2α are rapidly metabolized and inactivated in the body. They must be given by continuous intravenous infusion or by repeated administration via other routes such as intrauterine, vaginal or intramuscular methods. The introduction of the methyl group in the 15 position of the Prostaglandins E2 and F2α protects them against enzymatic degradation by Prostaglandin 15-dehydrogenase, thus prolonging their duration of action and their potency (Bundy et al., 1971; Yankee and Bundy, 1972). The clinical application of these analogs to terminate pregnancy was first reported by Karim and Sharma (1972). The analog 15(S)-15-methyl-prostaglandin F2α (15-me-PGF2α), unlike the naturally occurring PGF2α can be given intramuscularly without causing local inflammation or severe pain at the site. It also has a practical advantage in patients with ruptured membranes in mid-trimester pregnancy. 15-me-PGF2α has an overall potency of approximately ten to twenty times that of PGF2α. A large number of clinical trials have been carried out since 1972 to evaluate the usefulness of intramuscular 15-me-PGF2α for termination of mid-trimester pregnancy (WHO Multicenter Study, 1977). While the efficacy of 15-me-PGF2α is not in doubt, the incidence of gastrointestinal side-effects, such as nausea, vomiting, and diarrhea, are too high and in unacceptable ranges. In order to reduce the severity of gastrointestinal side-effects, antidiarrheals and antiemetics are recommended routinely as premedication and during the procedure. The side-effects can also be minimized by shortening the injection-abortion interval by the use of laminaria tents 12–18 h prior to the administration of 1 S-me-PGF2α (Sharma et al., 1975; Stubblefield et al., 1976). The use of laminaria has also reduced the number of serious cervical lacerations (Duenhoelter et al., 1976; Stubblefield et al., 1975).